Originally published March 16, 2006, at GJSentinel.com. My problem with this sculpture (if you could call it a problem) is that it seems sort of narrow up top. The shoulders are rounded, the head a tad small. Plus, the facial expression is kind of bland and the hair at the top of his head looks sort of like some 1970s Shaun Cassidy ‘do. 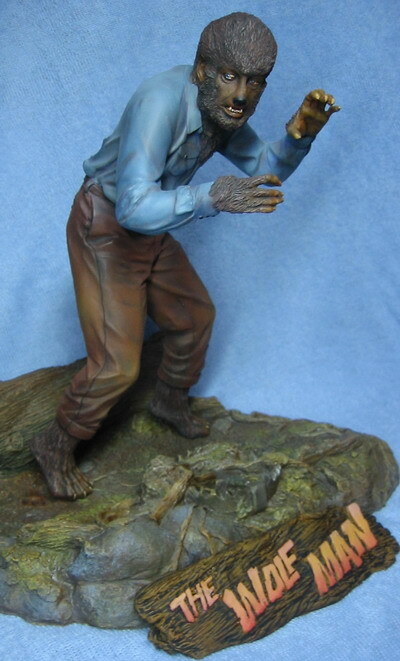 I’m not condemning the sculptor of this kit; his name is Mike Hill and he’s an astoundingly talented artist, particularly when it comes to werewolves. This just isn’t one of his best and he told me in an Internet chat room about three years ago that part of the reason for the kit’s understated impact is that it’s what GEOmetric wanted. Even if none of this stuff bothered you, the feet probably would. 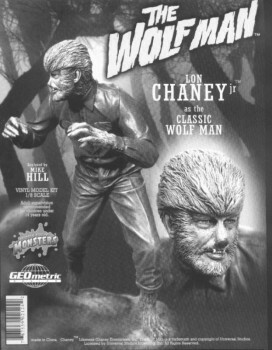 This kit’s Wolf Man is standing way up on his tiptoes, making balancing the figure a challenge. I built one and he wobbles every time someone steps too heavily near the shelf. 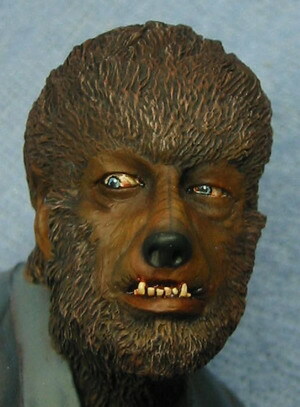 Cult of Personality’s Wolf Man replacement parts are made of resin and fit the 1/8 scale vinyl version of the GEOmetric kit. The replacement parts are sold separately from the kit, or you can buy both directly from Tom Parker for a great price. Price of the parts set alone is $25 postpaid, or $50 postpaid will also get you a bagged GEO kit (by “bagged”, I mean no box, no art, just the kit and you won’t need instructions to know what goes where). Just to make sure it’s clear, the kit doesn’t include a base. Bernd used one available from Resin Realities. If you’re inter- ested, send him an e-mail at cultof- personal- ity@peo- plepc. com. Tom describes himself as “compu- ter illiterate” and says he depends heavily on Clubhouse administrators Spock and Mark M. to help him get pictures online and other technical issues, but I know he’s comfortable enough with computers to answer e-mails quickly. He’s never kept me waiting long for a reply, and he’s never treated me poorly in … what? Probably 10 transactions in the last four years or so. Like pretty much everyone else, I first got involved with kits back in the mid-’60s (first kit was an Aurora Batmobile purchased through the mail for 35 cents and two cookie wrappers, if memory serves). • Carrie Kelly (with lasercut sunglasses and lenses) sculpted by myself, with Henry Frickel. • Batman head and owl (recast off Aurora). • Space Ghost sculpted by Jay Harless. • Godzilla train-car head and hand sculpted by Henry Frickel, to fit the Aurora Godzilla. • Adam West head and belt parts (portrait sculpt and belt pouches by myself, cowl by Henry Frickel). Fits the Aurora Batman. • King Kong face by Mark VanTine. Fits the Aurora Kong. • General Urko head w/ammo cartridges and gun in holster (face sculpt by myself, gun, ammo cartridges and helmet by Henry Frickel). Fits the Addar General Ursus. • Burt Ward head by Jim Maddox. Fits the Aurora Robin. • Rodan head by myself. Fits the Aurora Rodan. 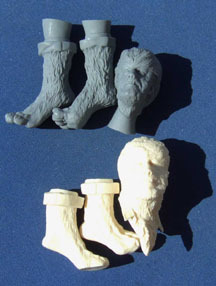 • Wolf Man head and feet by Jim Maddox. Fits the GEOmetric Design kit. Most of the replacement heads we did based on opportunity. If Revell or Polar Lights rereleased a kit and you could get it for $10 at Toys R Us, our goal was to put out a part (or parts) to improve that kit for not much more than the cost of the plastic kit. The choices were purely what we wanted to see, hoping that others would like them too. Sometimes we got lucky. We were able to get Aurora Kong kits from PL cheap, which prompted me to pursue Mark VanTine to do the Kong sculpt for us. Fortunately for us, Mark wasn’t super busy, he liked the project and did a fantastic sculpt for a very reasonable fee. Three years later we are getting ready to pull a fourth mold on this; it is creeping up on Godzilla as our best seller ever! The Wolf Man was also a matter of timing. I was able to get a fairly large supply of these from George Stephenson when he was selling GEOmetric, and then from out of the blue, a talented sculptor named Jim Maddox contacted me about a ’60s Batman project (which became the Burt Ward head). In the course of talking to him, I found out he was a huge fan of the Universal Monsters, but more importantly, around that same time he had posted pics in the Clubhouse of a Planet of the Apes head he had done. Within a day from the time I saw the picture, I had worked out a deal with him to do a portrait head and feet. 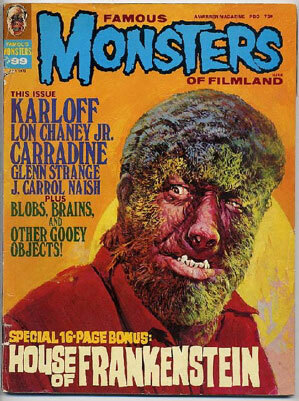 The head I chose to have him do is an iconic image from an old Famous Monsters of Filmland cover (which was based on a publicity still from “House of Dracula”). The feet were actually from the first movie, and the main reason I even bothered with them at all is the kit feet were solid vinyl on “tiptoes” and even if you fill the vinyl parts and pin them, the figure tends to wobble on its base. Now would be a good time to add that our parts are designed for the VINYL version. Because the head features the open collar version of the make-up, you will need to cut away the collar and the front of the shirt (much easier on hollow vinyl, than solid resin, although a couple folks have done it). …By the way, I recommend leaving about a quarter-inch of the vinyl flashing in place on each bicep before gluing it to the torso, then filling the gaps with epoxy putty to effectively broaden the shoulders. You will need to sculpt in a few folds and seams to match the kit parts, but it should be no big deal. This article was posted in 2006 archive, Monsters, Producers, Resin, Vinyl and tagged Cult of Personality. Bookmark the permalink. Follow comments with the RSS feed for this post. Both comments and trackbacks are closed.